At RBM of Alpharetta, we are dedicated to providing each and every customer an enjoyable and upmarket car buying experience. Since our inception in 1963, we have helped thousands of car shoppers find impressive Mercedes-Benz vehicles that fit perfectly with their budget and lifestyle needs. In addition, we offer honest, market-based pricing and a no-pressure environment. Whether you’re searching for a used sedan, coupe, SUV, or convertible, our diverse selection of Mercedes-Benz vehicles, as well as models from other automakers, is sure to feature a vehicle that meets your preferences. Selecting a Pre-Owned Vehicle – When you visit our dealership, a friendly and knowledgeable sales professional will meet with you to determine what type of vehicle and price point you are searching for. Once your needs are understood, you’ll be met with a variety of viable pre-owned options. During this time, you are free to ask any questions or test-drive any vehicles that peak your interest. Whether it’s a 2011 E 350 sedan or a 2015 GLK 350, we guarantee that you’ll find a model that is right for you. Financing a Pre-Owned Vehicle – Once you find your ideal pre-owned vehicle, we’ll get to work on the fine details. Our team of finance experts have the experience and resources needed to make paying for your used vehicle as affordable as possible. Regardless of your credit history, we will work with you to design a payment plan that comfortably fits with your budget. To get a head start on the financing process, you can fill out our online auto financing form from the comfort of your home. Maintaining a Pre-Owned Vehicle – Vehicle maintenance should be a top priority for all used car shoppers. Fortunately, caring for your vehicle is easy, thanks to our in-house service center. Our state-of-the-art service center is staffed by well-trained technicians that know the ins and outs of every type of vehicle. Whether you’re in need of a simple oil change or a more complicated engine repair, we’re here to help. Choose premier express service for quick, reliable maintenance without making an appointment. Or, feel free to schedule a service appointment online any time. Additionally, any pre-owned Mercedes-Benz (and non-Mercedes-Benz) vehicle is one-of-a-kind. In most cases, the exact same vehicle with the same options and mileage cannot be duplicated, giving customers a vehicle that is truly their own. 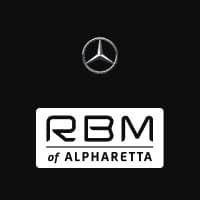 We guarantee that you will be amazed by the top-notch customer service and luxury shopping experience at RBM of Alpharetta. If you would like to find a dealership that gives you the exceptional used car buying experience you deserve, visit RBM of Alpharetta today. If you have further questions on the types of pre-owned vehicles we offer, or specific concerns regarding financing or service, do not hesitate to call us at 678-637-2333.